Delta is gearing up for the holiday season and is offering an increased bonus for shopping through their portal. From now until November 19th you’ll earn a one-time bonus of miles on top of what you would earn normally for the purchase. For those who are trying to build up their balances for their next trip this would be a good option for you. If you were to spend the bare minimum of $150 or $300 the bonus alone would net you a good rate of 3.33333 miles-per-dollar in addition to what you would earn from the purchase. It’s a good deal to hop on while it lasts. During the “Holiday” bonus campaign, which runs from 11/06/17 through 11/19/17 at 11:59:59 pm ET (the “Bonus Period”), Member will earn a one-time bonus of up to up to 1,000 bonus miles on qualifying purchases, in addition to the standard SkyMiles® Shopping miles earned from shopping online through the SkyMiles® Shopping mall. This one-time bonus award will be determined using one of the following tiers, based on Member’s cumulative qualifying purchases made during the Bonus Period: Tier 1 bonus: 500 miles for qualifying purchases of at least $150; or Tier 2 bonus: 1,000 miles for qualifying purchases of at least $300 or more. “Qualifying purchases” do not include returns, cancellations, shipping and handling, taxes, gift card or other cash equivalent purchases, and certain products that are not eligible for bonus miles. 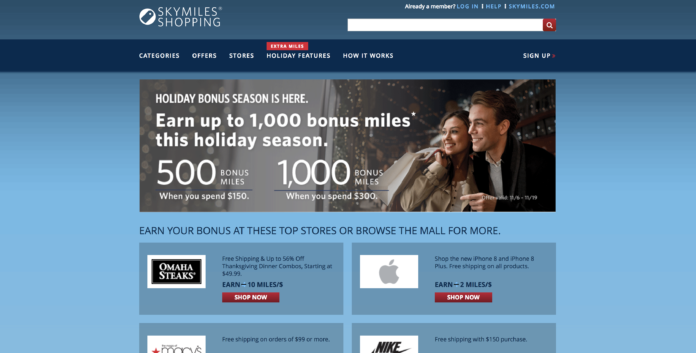 Please see the SkyMiles® Shopping site for details on product eligibility and other restrictions. Please allow 8-10 weeks for bonus miles to post to your SkyMiles® Shopping account. The Tier 2 bonus provides the maximum number of miles that will be awarded. Void where prohibited by law.